My Goodness what the sunshine does to our telephones – the telephone has been red hot this week, with everyone rushing to re-book for Hay Festival and other people just realising school holidays are just around the corner and they had better book up a holiday quickly. There are still new properties coming on the books and lots of great bargains for last minute bookings – take a look at the website. I think probably this has been the most successful Hay Festival ever – we all had a brilliant time and by the end the Land Rover pretty much knew its own way over to the car park – whether in mud or most days sunny. Tomas Twizy, our little electric eco car really had a good time – nipping around Hay and the festival site – but in the end he looked as if he had been in a rugby match ……. so so muddy. It was great PR for us – and now Ann has taken him to Hereford for his MOT quite a trek so lucky to start in Hay. Ann managed to discuss maps and pop into see an exhibition at The Mappa Mundi – all in a days’ work! 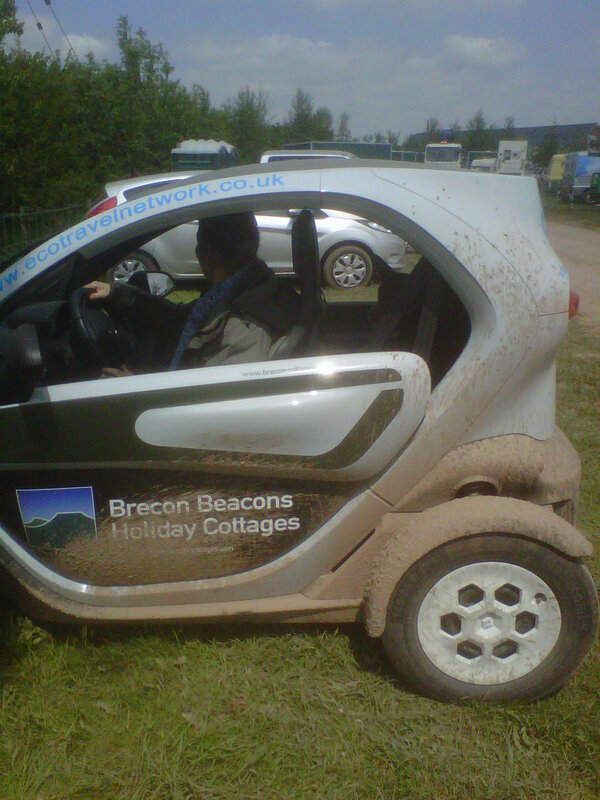 Tomos after his spell at Hay Festival.... the car parks were muddy! Anyway now Tomos is fit and well and ready to be hired out by visitors. Alannah Weston was great in both her sessions in discussion with Lily Cole and Steve Trent discussing her pet subject of “pollution in the oceans” and “the use of shark and whale in beauty products” and again on the Friday discussing business with Dylan Jones – the session we agreed to sponsor. Anyway now Alannah and the family and my daughter, Rachael and family have gone so we feel quite bereft after such a full on week. They all loved Plum Tree, it was an extremely popular place to stay and there are only a few weeks left now before it comes off the books after about 10 years – time for the owners to move home.